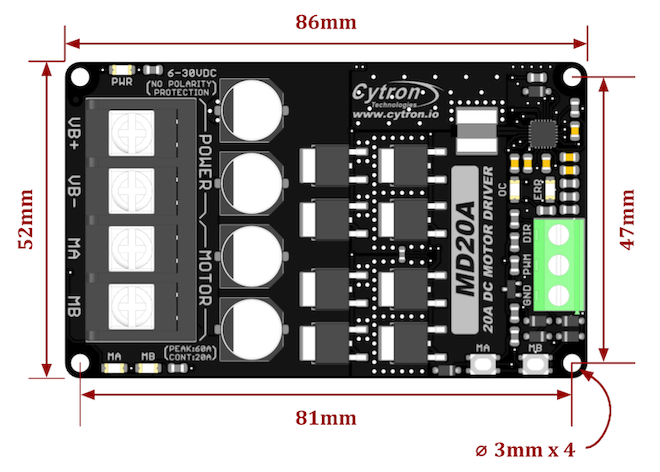 The MD20A enables bidirectional control of one high-power brushed DC motor from 6V to 30V. With discrete NMOS H-Bridge design, this motor driver is able to support 20Amp continuously without any heatsink. The onboard test buttons and motor output LEDs allow functional test of the motor driver in a quick and convenient way without hooking up the host controller. 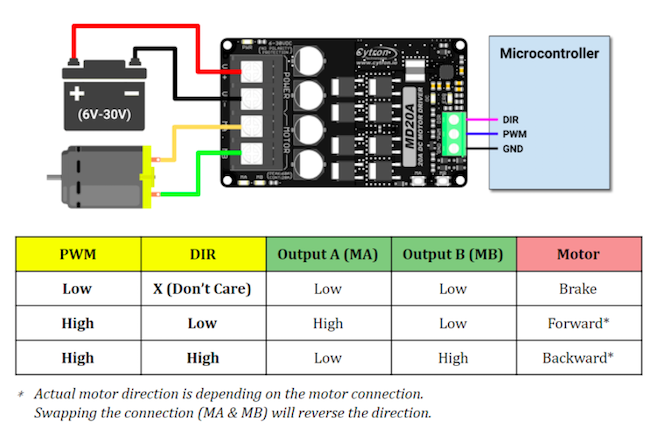 This motor driver can be controlled with PWM and DIR inputs. With input logic voltage range from 1.8V to 12V, it’s compatible with wide variety of host controller (e.g. Arduino, Raspberry Pi, PLC). Various protection features are also incorporated in the MD20A. Overcurrent protection prevents the motor driver from damage when the motor stalls or an oversized motor is hooked up. 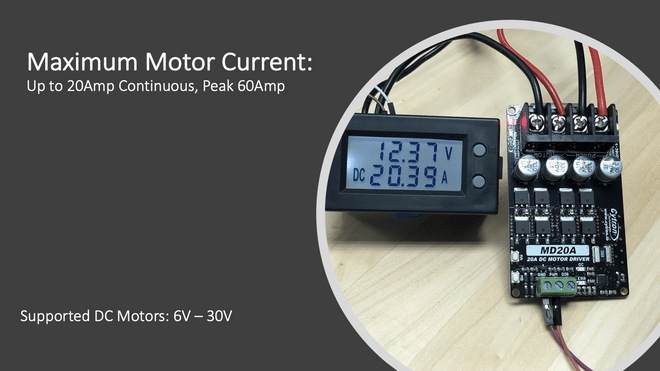 When the motor is trying to draw current more than what the motor driver can support, the motor current will be limited at the maximum threshold. Assisted by temperature protection, the maximum current limiting threshold is determined by the board temperature. The higher the board temperature, the lower the current limiting threshold. 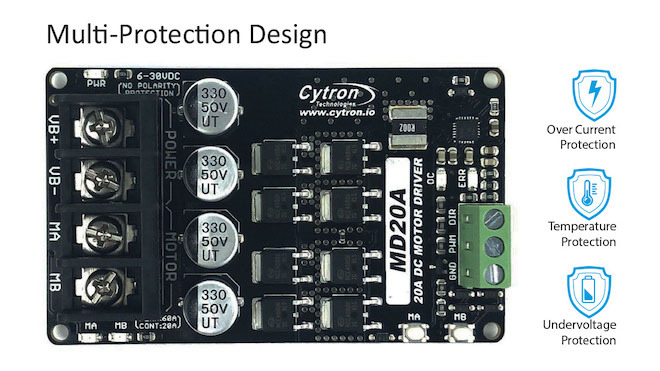 This way, MD20A able to deliver its full potential depending on the actual condition without damaging the MOSFETs. Note: Power input does not have reverse-voltage protection. Connecting the battery in reverse polarity will damage the motor driver instantaneously. Bidirectional control for one brushed DC motor. LEDs for motor output state. Inputs compatible with 1.8V, 3.3V, 5V and 12V logic (Arduino, Raspberry Pi, PLC, etc). PWM frequency up to 20kHz (Output frequency is same as input frequency). Compatible with sign-magnitude and locked-antiphase PWM operation. Overcurrent protection with active current limiting. Example Application: Automated Guided Vehicle (AGV), Solar Tracker, Game Simulator, Mobile Robot, Automation Machine.